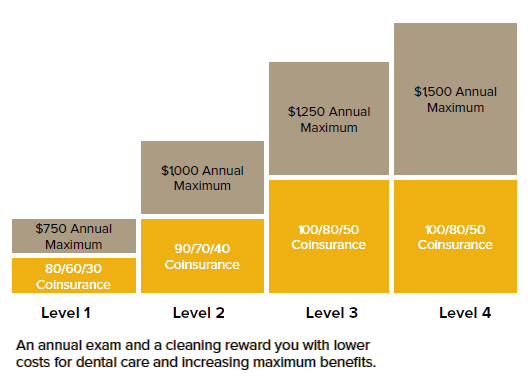 When you get your teeth cleaned and examined every year, you’re rewarded with greater benefits the next year. Watch your annual benefits increase and your out-of-pocket coinsurance decrease. Periodontal maintenance, limited to 2 per benefit year in lieu of preventive cleaning. Replacement of prosthetics is limited to replacements made at least seven years from the most recent placement; limited to once in a seven year period. Click here for Individual Incentive 10 Dental Policy Exclusions.